I have been asked one question thousands of times since I became prominent in the bodybuilding game. Whenever a group of the “uninitiated” and I get together they always want to know what satisfaction I get out of working with weights. It is hard to explain to those who have never used barbells. That you realize this I am sure, but one would think the obvious signs a weight training course stamps on the general bearing and appearance of a man would be sufficient explanation. But, no . . . always that old sleeping pill crops up: WHATEVER do you see in weight lifting? I can’t understand what you get out of picking up lumps of iron.” Maybe the person who asks me this question happens to be a golfer, so I promptly ask him what joy there can be in knocking a small ball away from you and then running after it. When he recovers from this reply, and gives me a somewhat weak grin, I then start in to sell him workouts with weights. I tell him first of all how barbell exercises and kindred heavy resistance movements are recognized and respected all over the world by physicians and surgeons. I also indicate that these exercises have done wonderful work with the war wounded. I talk of the increased self-respect, the better posture, the greater joy experienced in living a life that is healthy, carefree and happy. I tell him how personal appearance can be improved – the clear eyes and complexion, the upright carriage and springy step etc., and then I invite him along, if I happen to be training at a nearby gym, to take a workout with me. And this I have NEVER seen to fail, that these skeptics become the greatest and most enthusiastic missionaries for weight training inside of a month. Perhaps it is because of the near miracle that barbell work accomplishes, or that feeling of overflowing energy that makes them want to run everywhere instead of walk. But whatever it is that brings the swift conversion from skepticism to a missionary-like fervor, or whatever they may think, I have my own ideas. Now, all pressing movements are good triceps builders but they hardly place direct stress on the muscle. Presses are performed by a wide range of muscles with the triceps playing a part. Exercises in which the forearm is straightened out on the upper arm are best for maximum triceps development. However, if you are working solely for triceps size and strength it is best to incorporate a number of pressing movements in with the direct triceps work. Thus you can add thickness to the muscle as well as definition and an increase in LOCAL power. If, however, you are working for maximum arm size, that is a horse of another color and thus I will discuss at the end of the article. So, let’s get to my favorite triceps movements. The first movement is one that Charlie Smith introduced me to about a year ago and since then I have worked very hard on it and I believe that it has affected the overall growth of the triceps, particularly the inner head, more than any other movement. Charlie told me, as I also knew, that it wasn’t a new exercise by any means, but he thought that with my rather long upper arm it would be particularly effective. 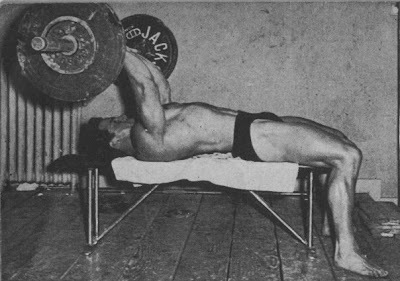 It is performed as follows; You lie on a bench and you have the barbell handed to you as you hold your arms straight up. You take a rather narrow grip . . . the hands should not be more than 5 to 6 inches apart, with the palms facing to the front. From this initial position the bar is lowered by bending the forearms . . .THE UPPER ARMS DO NOT MOVE . . . and the weight is lowered either to the forehead or behind the top of the head, as you lay on the bench, and raised back again to straight arms. You will find that the movement is harder when the barbell is lowered to the forehead than behind the head. The reason is that the upper arms are forced to come out of perpendicular when the bar goes behind the head. After you have broken in to the exercise, you can have someone hold your elbows so that the upper arms get no “play” at all and are kept absolutely immoveable. Use 3 to 5 sets of the movements and with a poundage you can squeeze 5 reps out of. When you can do 9 reps, it’s time for a weight increase. The important point to remember here is that you DO NOT MOVE THE UPPER ARMS. My second favorite triceps exercise is the movement popularized by Johnny McWilliams – the triceps curl, or as some call it, the french press. Here, you stand upright, with a barbell held at arm’s length overhead. Your grip is narrow again . . . the same as in the first movement. From this arm’s length position you simply lower the barbell back of the head, again keeping the upper arms as immobile as possible. You will also find it best to have a training partner place his hand in the upper section of the back for support. You can do this movement two ways . . . in strict form and with slow and deliberate movements, or with a bouncing motion. And it is also good to force the reps by using a slight body movement or “push” to get the bar up when the last couple of reps get tough. Start off with a barbell you can use for 4 sets of 6 reps and as soon as you can do 4 sets of 10, increase the poundage and start back at 6 reps. Parallel dips are wonderful triceps builders, but as in the other exercises, it is that “special” way of performing them that makes all the difference. Dips are my third favorite triceps exercise and it was Marvin Eder who got me to include them in my routine. It is advisable that you practice them for form until you are able to rattle off a fairly rapid 4 sets of 12 reps, before you start to increase the resistance. Keep the body as straight as possible and the arms CLOSE to the body and go all the way down. When you start up force to arm’s length with everything you’ve got, and LOCK the elbows. Take care that you don’t strain the elbow joint by being foolish in your progression or careless in your performance. It is a good idea to rub warm olive oil into the joint after you have finished. When adding extra resistance I tie weight around my waist, letting the triceps get full benefit by having the weight in back of my body. No muscle specialization course is really complete without at least one dumbell movement. I have included one that Clancy Ross has used. As in the other exercises, there are particular ways of performing it for certain results. 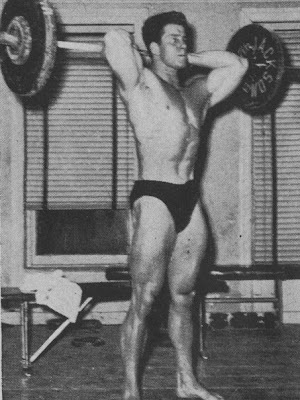 Simply hold a dumbell at arm’s length above the head. Press the upper arm against the head, lower the dumbell behind the head by bending the arm at the elbow and then straighten the arm again. KEEP THE UPPER ARM STILL, DON’T MOVE IT. When you’ve finished working one arm, change over to the other hand. You’ll find 4 sets of 6 reps, working up to 4 sets of 10 to be just right. Now, you can work this triceps schedule in one of two ways. If you want to work solely for triceps specialization, then it is best to use it just as I have given it here. But if you want to obtain MAXIMUM arm size and power, you would do well to remember that the main muscle groups of the upper arm are the biceps AND triceps. I generally spend three months on a biceps specialization routine, then three months on a triceps specialization routine. Then I take a three week layoff and start in again as follows. I perform one triceps movement and then a biceps exercise, alternating one triceps and one biceps exercise until my entire upper arm program is completed. I would advise that you try both approaches at first to see what reactions you get personally.